talking points you’ll need when sharing this life-enhancing product with new contacts, including the two groundbreaking discoveries made in the Hughes Center for Research and Innovation. What did scientists at the Hughes Center for Research and Innovation discover when conducting clinical tests on ProArgi-9+? What quality control tests are used to make sure ProArgi-9+ is a pure and superior product? What are the main ingredients found in ProArgi-9+ and what positive effects can these ingredients have on an individual’s overall health? 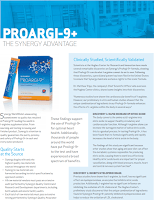 CLICK HERE to download the ProArgi-9+ flyer!